Cats. We Love ‘em! Cute, cuddly, intelligent and independent, they are part of the family for millions of us. However we all know about their reputation for dabbling in the darker side. Since the Middle Ages cats have been associated with witchcraft and demons, kept by witches as familiars “those hellish imps that took the forms of animals to assist witches in their evil deeds”. Sounds pretty metal! Even today, some of these these stereotypes have survived. You've probably heard the one about black cats bringing bad luck, right? Black Metal Cats is a Twitter account that celebrates the inherent doom that our feline friends possess. 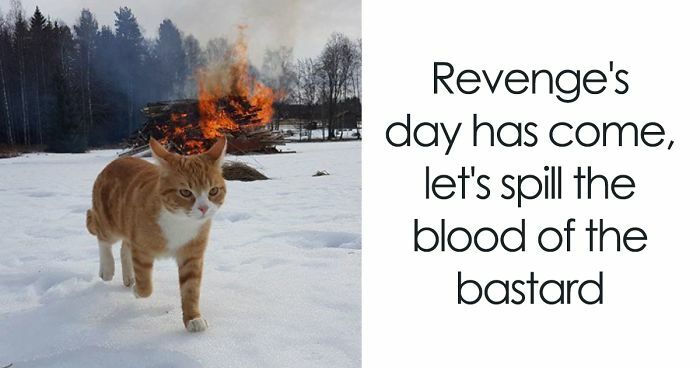 Bored Panda has compiled our favourite tweets from the account, perfectly pairing dark, black metal lyrics with brooding pictures of cats that hilariously capture the mood. Best viewed with slow, heavy metal music playing in the background. OMG!!! YES!! YES!!! This ENTIRE post has MADE MY DAY!! I LOVE IT! THANK YOU Greta J!!!! OOOH!!! Just THE BEST one! He is the "Master of the Daily Rites and Sacrifices"! ANON! COME!! All ye who would taste of the mayhem and death!!! arghhh!! my heads on fire!! put it out!!! That's the really evil equivalent to Alfred Hitchcock's "Birds". Not again .... ( HEEEEEEY CINDY WHY ARE THERE SO MANY PHOTOS OF YOU !!? THIS WAS SUPPOSED TO BE DONE AS A SEEEEEEEEEEEEECRET ! Vengeance WILL be mine!!! MWAH-HA-HAAAA!!! The Marty Feldman of cats! Eat up troops! You will need all of your energy to assist in unleashing the CARNAGE!!! Dark matter in life form! At first glance, he looks harmless...then, I looked closer at his EYES!! Insanity lurks within! woooaaaaaa one of the best!!!! Now this sounds just like a cat ! Nope, not happening on my watch. Oh come on you believe me don't you? Told you we would be back and Damn it's cold out here, please let us in. I adore you, big fluffy Satan! I'll get you my pretty. We smile to warn ‘you’ to back off! Can't you tell I really need help here. I see right through your wishful thinking of my pressence.. you will continue to appease me when i want.. I did not ask for this collar but perhaps it might work better for the human creature to know who is boss! I've been in many a battle! ..& you actually believe you are smart, yet you still can’t read the windows into our dark souls.. "GAH!!! Mittens?! What did I say about using the flashlights to scare me!" Looking good is my speciality, especially after a good ordered fight..
And the earth will praise all that are dark & strong..
..you do know i am waiting for the right time.. Throw me out in the snow...I know where you sleep!! Ok, I was not expecting Lil' Bub to show up in this. Wait...I remember, my food bowl!! The ‘so called evil’ is keeping control by accurate movements,& watches always the greater evil.. The human creature! How dare they... they’ will pay!